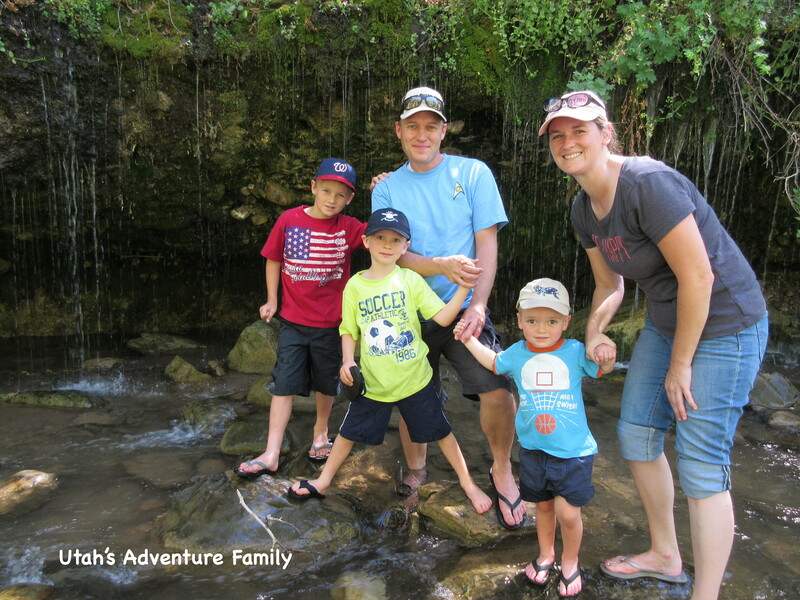 We like to plan outings to out-of-the-way sites and spend a few days exploring the area. We’ve done this with Vernal, Delta, and Moab. 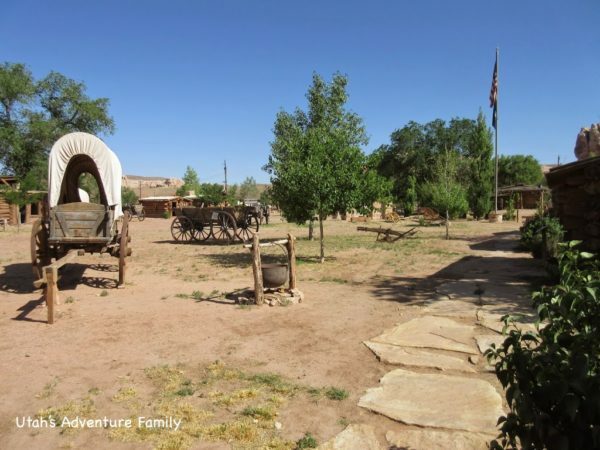 After our trip to Moab over Spring Break, we decided we missed a lot of activities in the southeast corner of the state, so we planned a separate trip to Blanding this summer. We found a lot of great adventures that seem to be relatively unknown. Just click on any link to read more about each stop. I’ll start with our big day making “the loop” because it turned out to be a particularly well-planned day. We made 8 stops and saw a lot of amazing things. This map shows our route from Blanding clockwise around the loop. 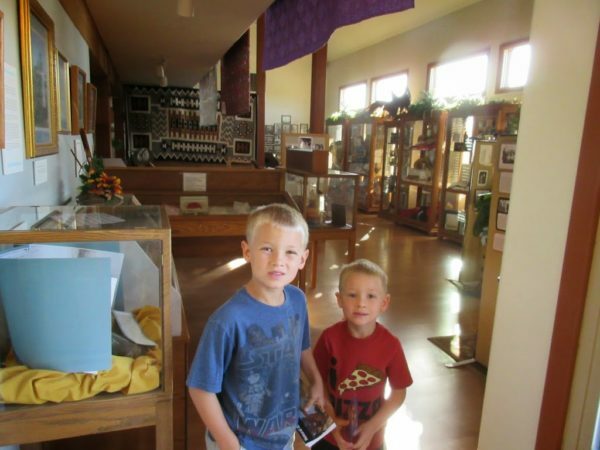 There are many artifacts in the Blanding Visitor Center. At 8:00 we stopped at the Blanding Visitor’s Center for information on some of the sites we’d be seeing. There is a small museum in the Visitor Center, and we got a lot of questions answered at this stop. Then we headed south to Bluff. Fort Bluff was such a fun environment. Everyone was friendly and we learned so much. Fort Bluff got a nice new makeover and was a highlight of our trip to this area. We learned about the incredible Hole in the Wall descent of the Pioneers and strolled through the dozen or so cabins in this rebuilt pioneer town. Plan to spend 2-3 hours in Fort Bluff. You won’t be disappointed! 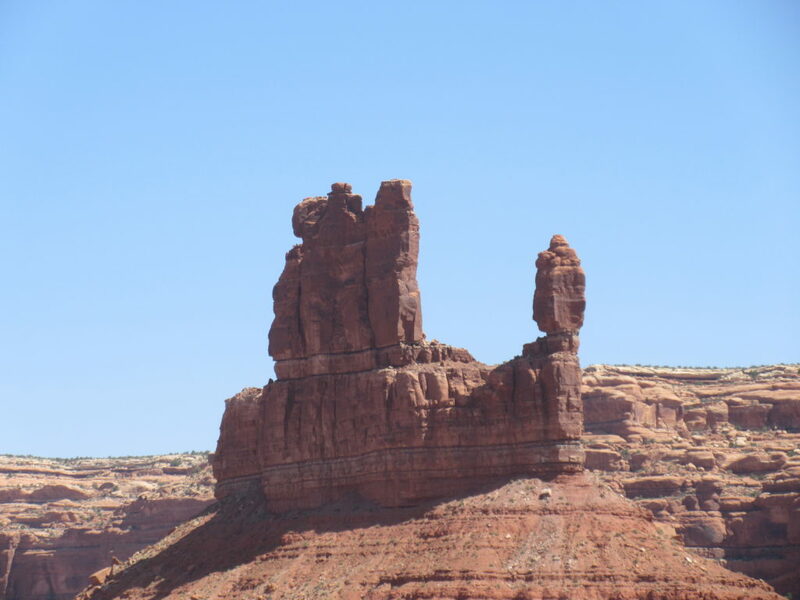 There were so many beautiful rock formations in Valley of the Gods. 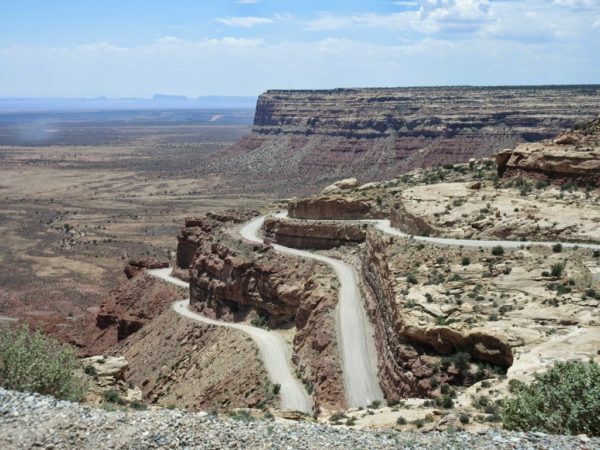 To the west of Fort Bluff, we turned up a washboard road to the Valley of the Gods. This is a 17 mile loop that takes you past towering stone structures. 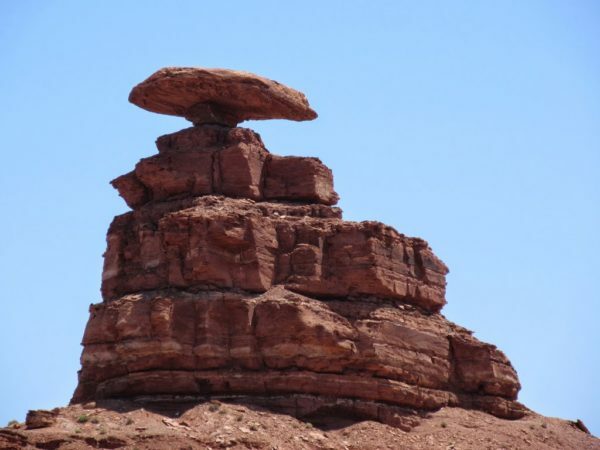 It’s sort of like Monument Valley’s little brother. 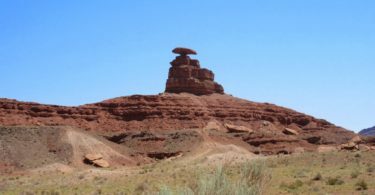 A short distance up the road is Goosenecks State Park. You have to stop here if you drive by. It’ll only take $2 and about 20 minutes, but it is amazing how the river isn’t smart enough to just go straight. I mean, come on . 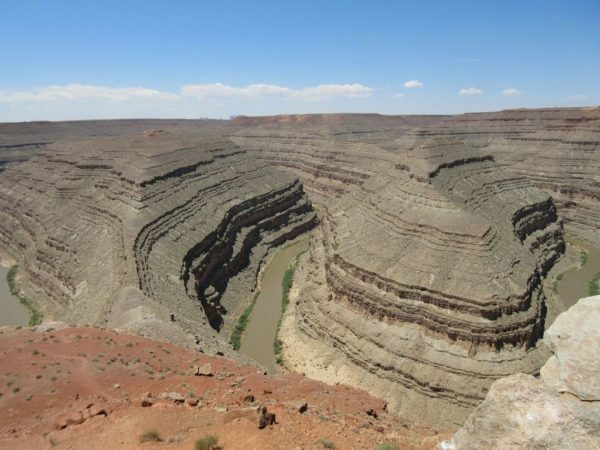 . .
After Goosenecks, we drove up the Moki Dugway. This is one of the most unique stretches of road in America. It is sort of like Hole in the Rock for cars. We wound and twisted our way up the cliff face on a narrow steep gravel road. There are some great views at Muley Point. 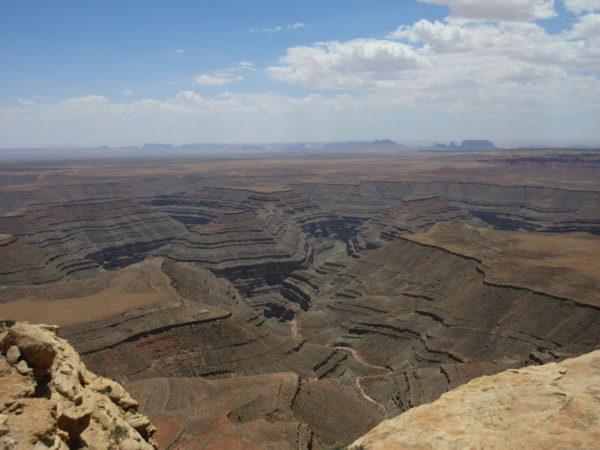 Here are the Goosenecks with Valley of the Gods way off in the distance. Right at the top of the dugway is Muley Point Road. It is about 4 miles out to the overlook, but they are 4 rough miles. You arrive at a wide open vista that overlooks Monument Valley far to the south. This is the Owachoma Bridge, the largest in the park. 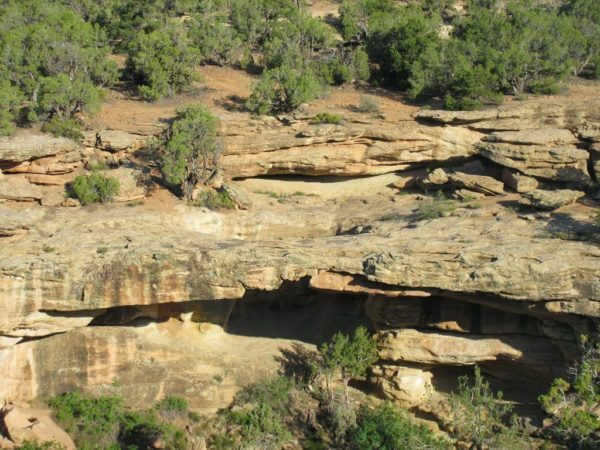 At around 3 pm we reached our final destination, Natural Bridges National Monument. There are four short hikes, and we did 3 of the 4. We had dinner in the car and stayed late for the stargazing tour which started at 9:30. Then we headed back to Blanding. It was the perfect day! We stopped at the following places on our other days in Blanding. 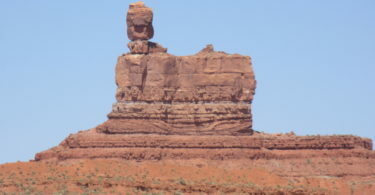 There was so much to see and do in this area of Utah. 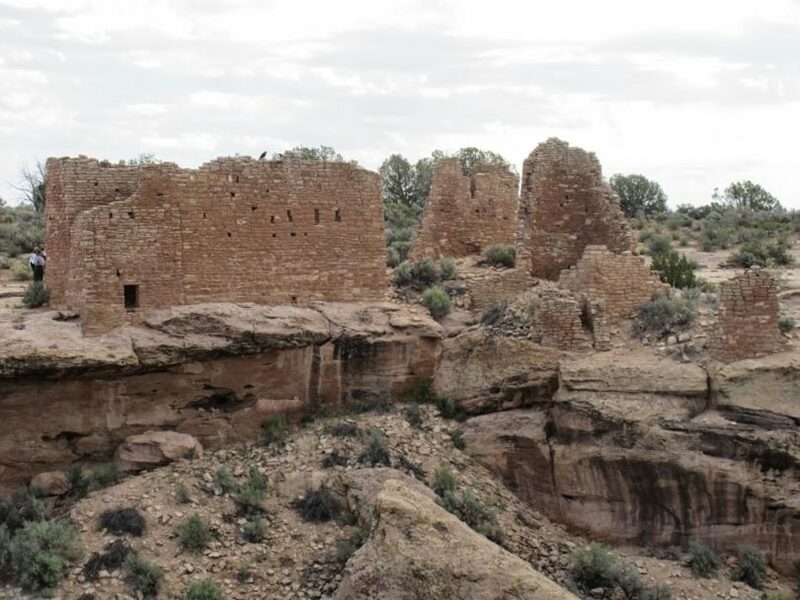 Hovenweep National Monument is an amazing look into the past. 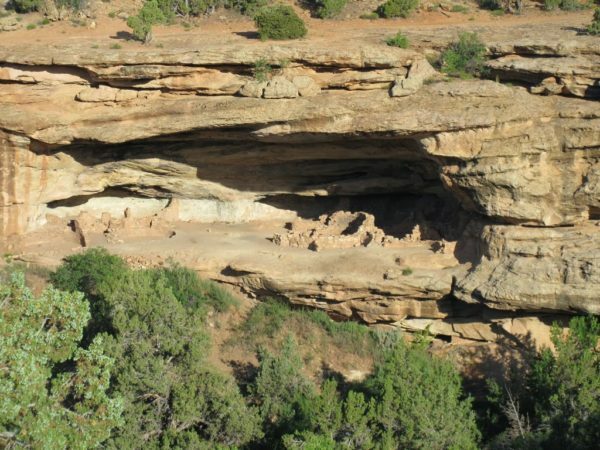 Plan to spend half a day hiking and driving to 800 year old stone structures built in groups along the canyon walls. 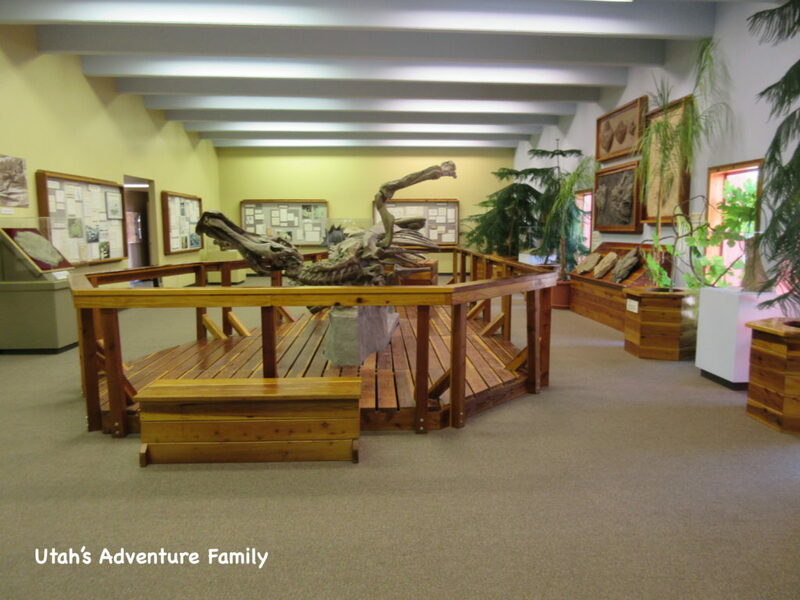 The Dinosaur Museum in Blanding is a really cool stop. They have unique artifacts like 3 trees that are 250 million years old (and petrified) of which there are only 6 in the world and dinosaur skin imprints. My favorite section was the movie tributes, though. An entire wing is dedicated to campy dinosaur movies that were popular in the 50s and 60s. 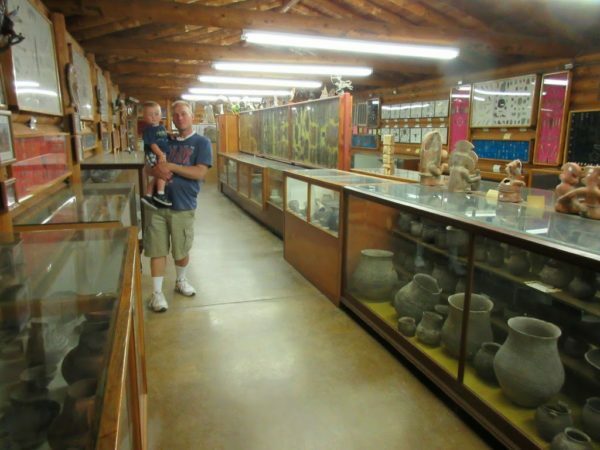 If you’d like to go to an incredibly eccentric museum, try Huck’s Museum located in Blanding. Huck has collected an amazing amount of artifacts, and some might say he’s a bit of an artifact himself! Edge of the Cedars State Park is right in Blanding. We had so much fun at this state park with the friendly rangers. They let our youngest do the Junior Ranger program. 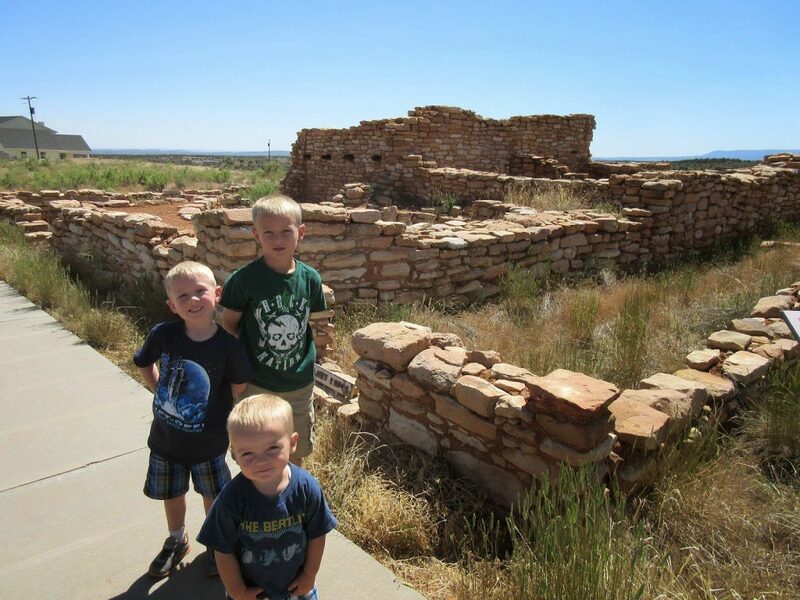 Our boys loved the ruins, especially the kiva that they could climb down into. 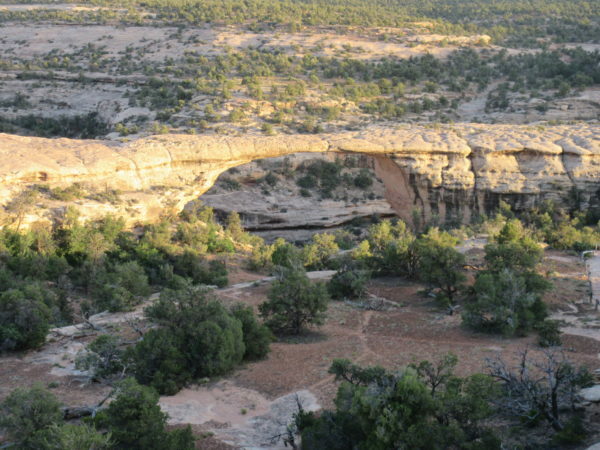 Nation’s Natural Bridge is just on the outskirts of Blanding. You can see the natural bridge across the canyon from the side of the road. There are people who say they hike down the canyon and back up to get closer to the natural bridge, but we decided that wasn’t for our family. This bridge isn’t quite as spectacular as the ones in Natural Bridges National Monument, but still a fun, easy stop near Blanding. The West Water Ruins are just down the road from Nation’s Natural Bridge. The ruins aren’t as large as at Hovenweep, but we enjoyed looking across the canyon at these small structures. There are quite a few kivas, and some stairs. Some people venture across the canyon, but we wouldn’t recommend it for safety reasons for you as hikers, as well as for the preservation of the ruins. 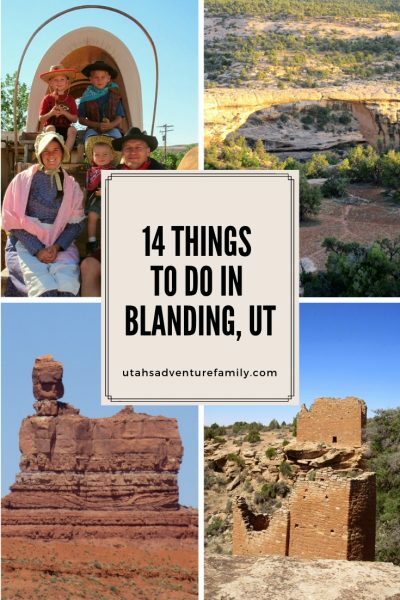 Plan a trip to Blanding. It’s out of the way, not too touristy, and there is plenty to do.